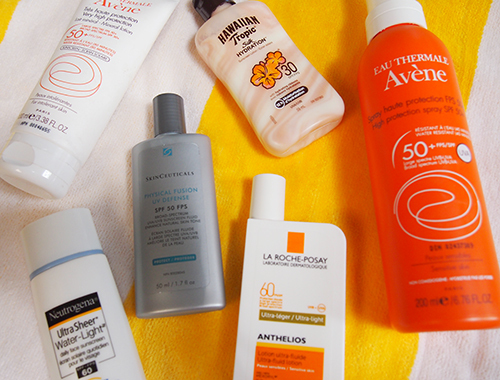 Okay, this isn't really a "showdown" as much as it is a run-down of the sunscreens I've been using lately. Vancouver has been having a bit of a heatwave (understatement), and I have naturally been spending a ton of time at the beach. But even when I'm not at the beach, I have still been slathering on the sunscreen. I read an article in a British magazine while on vacation about all these girls who got melanoma despite taking precautions and it kind of freaked me out. Since I have been a bit more lax about it in the past, this summer I am taking my sun protection VERY seriously. I was gifted a bunch of sunscreens from Avène a few months ago and took them with me on my recent European adventures. The Avène Très Haute Protection SPF 50+ (white tube) is a mineral sunscreen that is specially formulated for the most sensitive of skin types. Mineral sunscreens provide the best tolerance as they don't penetrate the skin, and this particular one is also paraben-free and water resistant. I put the water resistance to the test while enjoying the outdoor thermal baths in Budapest and was pleased to find the water beading off my skin. However, the formula is very thick and because it doesn't absorb, it kind of sits on the surface of your skin. As such, I would recommend this more for paler girls because it leaves a white cast which looks weird if you're more tan like I currently am. I have since switched over to the Avène Haute Protection SPF 50+ (orange tube) which has a much lighter formula that does not leave me with a visible white cast. It's also paraben-free and water resistant, and I especially like the spray bottle which makes for easy application. On days when I want something a little lighter and more tropical, I have been turning to my Hawaiian Tropic Silk Hydration SPF 30. I've been using this brand on/off for years and I usually always return to it because I love the scent and the moisturizing crème ribbons. This particular bottle is travel-size which I love because I can just throw it in my bag or purse and it takes up next to no room. In terms of face sunscreens, I've been rotating a few different ones. First, my HG Neutrogena Ultra Sheer Water-Light SPF 60 which I reviewed ages ago (check that post for my thoughts since they still hold true). I was recently sent a bottle of the La Roche-Posay Anthelios Ultra-Fluid SPF 60 and actually find it quite similar to the Neutrogena. The formula is a milky fluid that is light, absorbs easily and makes a great base for makeup. Plus, it's paraben-free, fragrance-free, and water resistant, so basically all the good stuff you want in a face sunscreen. I have also been experimenting with SkinCeuticals Physical Fusion UV Defense SPF 50. I have reviewed another SkinCeuticals product before and was impressed so it's no surprise that I really like this one too. Although it has the usual sunscreen features like being paraben-free and water resistant, what's most interesting to me is the fact that it's tinted. It reminds me a lot of a BB cream so I've been wearing it on "no makeup" days (quotes because let's be real, there's always some makeup), but it can also be worn under foundation to achieve a super even and radiant complexion. This sunscreen is also formulated with artemia salina, a plankton extract, to increase skin's defenses and resistance to UV and heat stress. Not sure if my skin has actually been building up its defenses but I do like the idea of it.